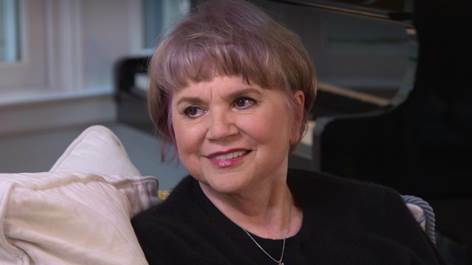 Legendary singer-songwriter Linda Ronstadt opens up to Tracy Smith about the loss of her singing voice, her career, living with Parkinson’s and more, in a revealing interview for CBS SUNDAY MORNING to be broadcast Sunday, Feb. 3 (9 a.m., ET) on the CBS Television Network. Ronstadt, who is 72, has sold more than 100 million records and is known for such hits as “You’re No Good,” “It’s So Easy” and “Blue Bayou.” Ronstadt tells Smith she noticed something was wrong with her voice in 2000. In 2013 she was diagnosed with Parkinson’s. Today, Ronstadt can no longer sing. “I can’t even sing in the shower,” Ronstadt tells Smith. Ronstadt doesn’t get angry at her situation – there’s no point in it, she tells Smith. Ronstadt says the problem with her voice emerged when she tried singing and couldn’t. She then found herself yelling at concerts, rather than singing. She played her last show in 2009 and retired from the stage before she knew what was really happening to her. She has not completely disappeared, however. Last fall, before a packed house, Ronstadt appeared on stage at a theater in Los Angeles to talk about her music and her life. And this week, Ronstadt will release her first-ever live album, Live in Hollywood, which includes 12 songs that were pulled from a 1980 concert originally shot for an HBO special. In a wide-ranging interview, Ronstadt talks with Smith about her life today, what it’s like having hit songs, about getting a National Medal of Arts award and more. She also talks about the future and hopes for a cure for Parkinson’s.